Nestled on the edge of Liberty Square, across from Haunted Mansion and Memento Mori, you will find Columbia Harbour House — one of the original restaurants of the Magic Kingdom. This Quick Service restaurant opened in 1971 and is themed like a Revolutionary Era tavern or inn. When viewed from outside in Liberty Square, Columbia Harbour House looks as if it came straight out of a New England town. When viewed from Fantasyland the restaurant has a vintage German village feel to it. The inside however, definitely fits in with the Colonial American feel of Liberty Square. It reminds me of an old coastal town in Connecticut that my family visited one year on vacation: full of ship wheels, boat models, pewter-ware, and wood paneling. For years our trips to the Magic Kingdom included a mere walk by of the bell ringing cast member in front of Columbia Harbour House. The thought of eating greasy battered fish like found at fast food restaurants in our home town just didn’t appeal to us and we wondered why people always seemed to be going in. Boy were we ever disillusioned. One try of the Columbia Harbour House and we were “hooked”. Now it is a must do for every trip. Much to our surprise the menu did not consist of merely just fried fish. In fact, it is completely void of trans fats altogether, has healthy options like grilled salmon and the Lighthouse Sandwich (hummus, tomatoes, and broccoli slaw), and has a really amazing lobster roll. For those guests who are not big fans of fish (myself included), Columbia Harbour House even has chicken breast nuggets, a garden harvest or broccoli peppercorn salad, or the most amazing macaroni and cheese I have ever had (creamy, cheesy, and full of lobster and shrimp). The kids menu has chicken and fish nuggets, salad, macaroni and cheese, tuna sandwich, and a Smuckers Uncrustable. Another plus of the menu is the sides. Entrees are served with your choice of steamed broccoli, apple slices, or fries. You can also order couscous, clam chowder, vegetable chili, Greek yogurt, chocolate cake and seasonal cobbler. Even picky eaters can find something here. I usually stray away from eating things like tuna anywhere but in my own home, but was glad we decided to try it on our last trip. 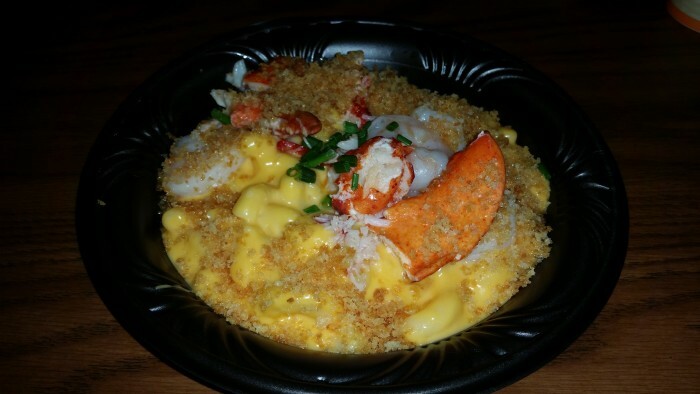 It is very tasty and large enough to split between two, especially when you MUST get the Seafood mac n cheese to split as well. 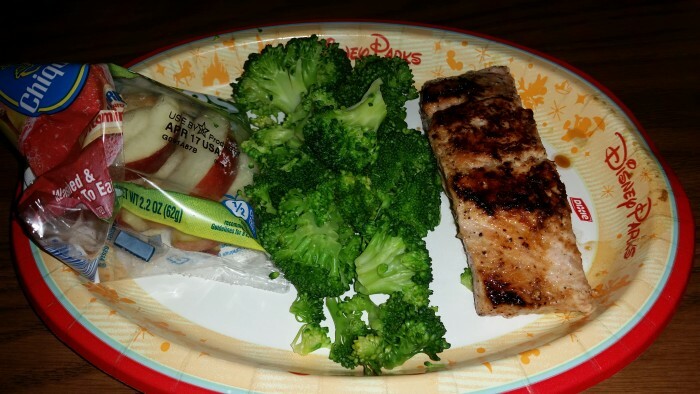 The portion of grilled salmon seemed smaller, but coupled with the steamed broccoli and apple slices sides the platter was enough to satisfy a hungry adult. And although we wanted to stay away from any fried offerings, one person in our party decided to try the chicken nuggets and fish platter with fries. It too was pretty tasty. We each sampled the fish and I must say it was not overly greasy and I would order it on my own. Although the lines can be long just to place your order (typical Disney kiosk style) we have never had an issue finding a table. Our favorite place to sit is upstairs. The views overlooking the main floor and also the outside into Liberty Square and Fantasyland are great. Upstairs is also usually less crowded. 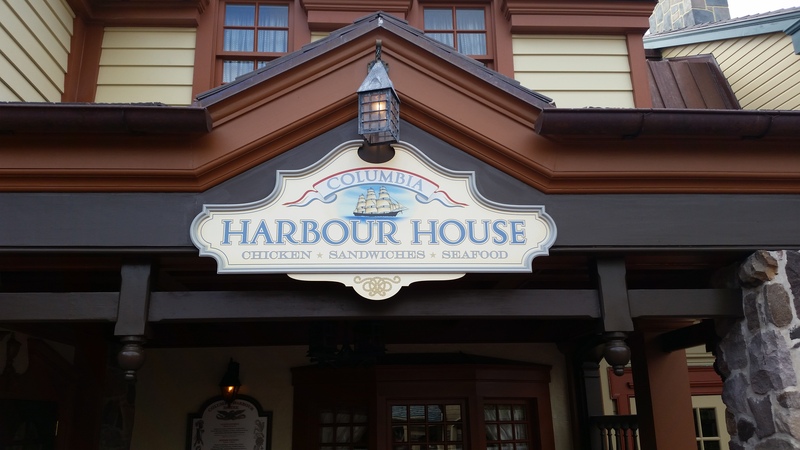 Columbia Harbour House opens at 10:30am daily and closing time varies with park operating hours. 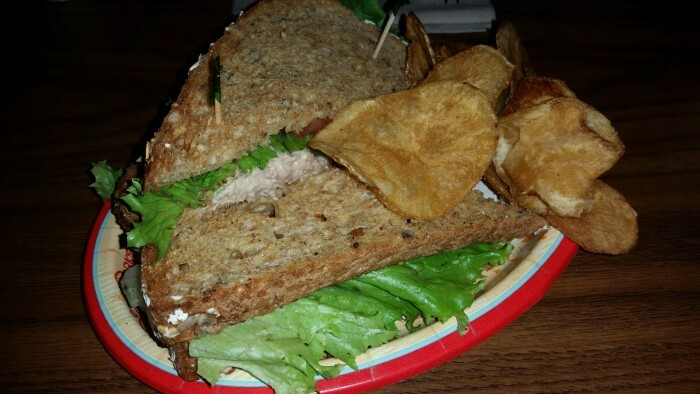 It is on the Disney Dining Plan and only counts as a quick service, although the food is table service quality. Entrees range from $7.99 to $12.49 for lunch and $8.99 to $13.79 for dinner; a real value for the quality and quantity of food. 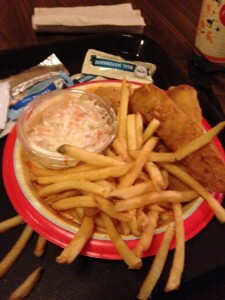 I have a fondness for Columbia Harbour House. We ate there a lot when I was a kid, my family were big fans of the long lost Monte Cristo they used to serve there. I still enjoy the restaurant with its current menu. 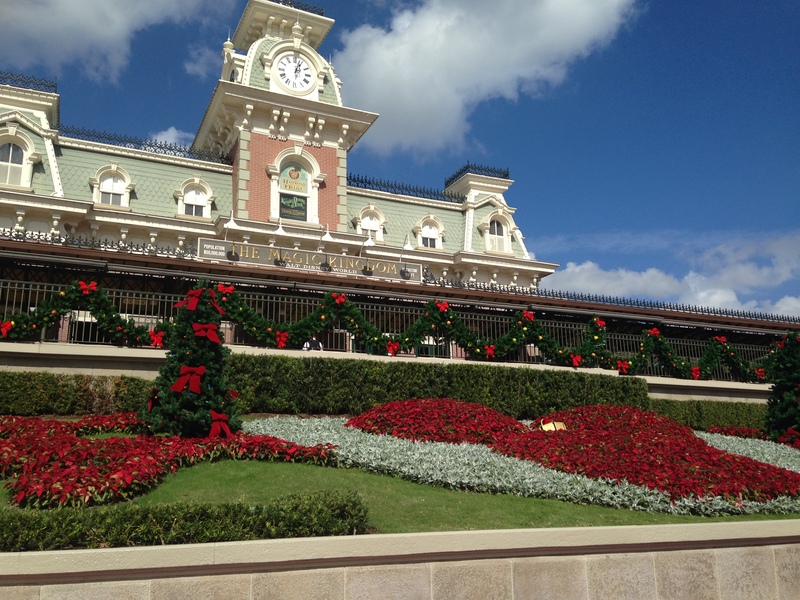 It’s also gives a great feeling of classic WDW, before everything got so value engineered and generic. May it never change–it brings back the good old days! 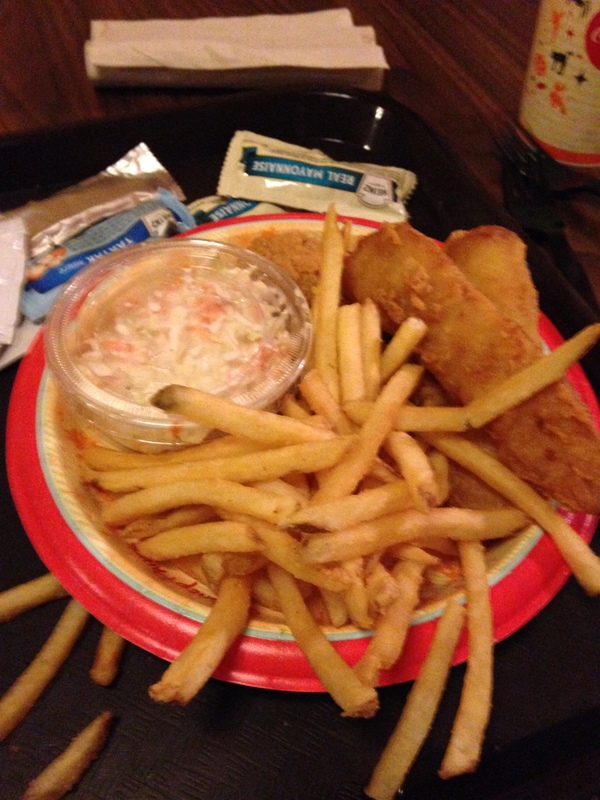 Columbia Harbour House is a must do for us. Love the food and the atmosphere. 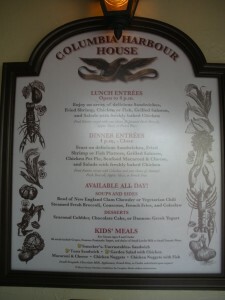 We love the Columbia Harbour House! It reminds me of what the Magic Kingdom was like when I went as a kid, even down to the music. The upstairs is still great, though I think the word is getting out about it. The fried shrimp platter is awesome, especially considering it’s a quick service!! A favorite of ours, too. My boys like to sit upstairs during the fireworks show. The whole building shakes. They like that more than the show itself. We are “hooked” too! Love to sit upstairs and enjoy a meal.